Opposition to military recruitment by youth activists suggests that young people in Puerto Rico are at the center of tensions caused by U.S. wars abroad. U.S. foreign wars have long elicited resistance in Puerto Rico. At the time of recording Guasábara, Whitney (2007) reported that the U.S. war in Iraq had killed 66 island-based Puerto Ricans and wounded 1,700 more. Between 2003 - 2007, 6,275 have joined the Army or Army reserve. Some 2,300 Puerto Rican National Guard and reservist soldiers were serving in Iraq. Recent opinion surveys in Puerto Rico put antiwar sentiment at 75% of the adult population, higher than the 62% in the United States. Most island wide antiwar sentiment and parallel activism are seen as propelled by sentiments towards Puerto Rico's independence movement. Local political parties have centered around three key themes, statehood, independence and commonwealth. While providing troops for Washington’s agenda, Puerto Rican's do not have a vote in U.S. elections. In parallel, the Cuban perspective of the U.S. war on Irak is very pessimistic, multiplied by the negative sentiment of Guantanamo bay as a site for holding prisoner’s of war. 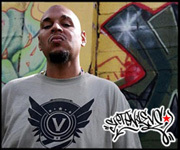 SieteNueve began his rap carreer in 1997 as part of a collective called "Conciencia Poética" that also included artists such as Luis Diaz, TekOno, and Yallzee, After six years with the group he broke off to work in his debut independent album titled “El Pro-Greso” produced musically by Yallzee. SieteNueve's lyrics tend to focus on issues relevant to Puerto Rico’s political climate as well as his own Afro Puerto Rican and Dominican identity. He is the most popular rapper of those termed "underground" (as oppossed to market-driven or mainstream) having shared stages with hip-hop artists in France, Brazil, California, México, Venezuela, and Colombia. Magia López is a member of the Cuban husband and wife rap duo Obsesión. The group was initiated years before Magia was incorporated into it by Alexey Rodriguez, who later taught Magia about rhyme, flow, and how to rap brining her in as a member of the group. Eventually, Magia and Alexey, artistically known as ‘El Tipo Este,’ remained as the only two members of Obsesión. Women in hip-hop have historically taken secondary roles as visual accents. Usually women are placed as the singular female in an all male crew – making them stand out as the novelty or the oddity. In many cases, women get involved with one of the elements of hip-hop through relationships with men, some of these may be familial or friendships, but most are romantic engagements. Unfortunately, when their relationships end, so does their experimentation with hip-hop culture. When they separate from these initiatory relationships they find themselves isolated from furthering their hip-hop careers. Many of the men – who are themselves competing to advance within hip-hop’s hierarchy – refuse to associate themselves with the ‘ex’ of another practitioner, colleague, or competitor. Be it for competitive reasons or if they find it best not to create discord amongst the male group. We find most women take on intermediary roles as bridges between popular culture and hip-hop. These roles predominate as hip-hop photographers, documentalists, designers, promoters, marketing or fashion designers, and journalists. Due to the nature of these roles, women have been primarily influential in the globalization of hip-hop. When acting as practitioners of one of the four elements, the sacristy of women leads them to network with one another despite the geographical barriers. In hip-hop hidtory hindsight, we find that a primary role women have taken has been as international disseminators of hip-hop. Popular topics from female rappers include: heterosexual courtship, relationships, infidelity and dishonesty, using men for profit (financial and security), independence, and sexual politics (with emphasis in the nightclub scene). In Cuba female rappers identify themselves primarily as independent feminists, motherly, spiritual (particularly with reference to Afro-Cuban Santeria), sensual (often with an exaggeration of Afro-Caribbean tropicalized themes), and sexually tough or secure. Magia, who has opted for a non hyper-sexualized appearance, donned primarily in African garb, whose image is oriented towards an afro-centric prototype, has a plethora of songs that she writes and performs independently from the duo, most of which pertain to women’s every day struggles in Cuba. These include issues about relationships, domestic concerns, prostitution, and Black pride. Magia has taken on a dual role in the Cuban hip-hop movement. She was at one time both a rapper in the group Obsesion and a government official in the role of the President of the Cuban Agency for Rap. Her dual role lent itself to a more visible representation of women in hip-hop amongst official Cuban hip-hop forums. These double roles for women are rare in hip-hop, rather much more common among men. Despite traditional feminine roles as multi-taskers, communities are less responsive to this in the hip-hop scene. Where it is more likely to see a man take on the simultaneous roles of rap group director, rapper, DJ, and promoter. More generally, women tend to take on one role within hip-hop cul;ture, and this role is usually an exploratory one. During the recording of “Son Dos Alas,” a second recording with a beat by Echo was in the works. This production was intended as an alternate collaborative song between Magia, from the rap group Obsesión, and Eddie Dee from Puerto Rico. Magia recorded her vocals for the proposed collaboration during the same session when Anónimo Consejo recorded “Son Dos Alas” at the Electro-Acústica studios. The proposed Eddie Dee & Magia track failed to blossom however. Magia preferred an altered tempo to the beat Echo offered and to complete she altered the beat significantly. Despite being willfully involved and enthusiastic about recording, Eddie was elusive to commit to the project, making it hard to formally develop his incorporation. A year later, SieteNueve brought up his interest in recording with Magia. Different from how “Son Dos Alas” was recorded, he wanted to go to Cuba to write the song together with Magia. The U.S. embargo prohibits the travel of US citizens to Cuba, with restricted exceptions made for families, and educational or religious endeavors. Artists may apply for a Specific License for travel to Cuba, travel through an authorized licensee, or defend their right to use the General License for travel to Cuba. Although this research was coveted by the University of Minnesota license for travel to Cuba, it would not protect SieteNueve traveling to Cuba to form part of the project. With Eddie De's blessing, SieteNueve began writing and recording the song titled “Guasábara,” in which he hoped to include a featuring with Magia. He selected the track for Magia’s featuring and gave me his draft vocals with a background track that was composed by producer Nuff Ced. When Siete Nueve released his debut album titled ‘El Progresso’ in 2004 I took Obsesión a copy. The album became Alexey’s favorite rap CD. Needless to say - the news that Magia would be recording with SieteNueve was very well received by the duo. In July of 2006, during my trip for the 2nd Annual Hip-Hop Symposium in Havana, Magia, and Alexey recorded their vocal tracks in the studio they have built out of their home. Magia and Alexey took turns engineering each other’s tracks while I filmed their interaction managing their roles between rappers, producers and spouses. I returned to Minneapolis where I mixed Magia and SieteNueve’s vocal files. However due to the equipment we used from Obsesión ’s home studio, the original vocal files were too distorted and not parallel with SieteNueves.’ I quickly learned how important it is to use the same equipment for vocals to be mixed together in the same song. Magia re-recorded her portion and sent a second copy back. Upon receipt Siete Nueve’s producer JKO Dox engineered the final mix. My role in this song was more so one of facilitator than producer. I often considered removing it from this research series because I did not engineer the song myself. However as the dissertation developed, this track has become essential to understanding the value of the collaborative tracks that followed suit, in particular, Sangre Guerrera. All recordings in La Habana, Cuba completed by permission from the Office of Foreign Assets Control, authorizing the Office of International Programs at the University of Minnesota, #CT-9841, licensing Melisa Rivière Ph.D.
Las grabaciones en la Habana fueron ejecutadas con el permiso y autorización otorgado a Melisa Rivière Ph.D., licencia #CT-9841, por la Oficina de Control de Capitales Extranjeros, por medio de la Oficina de Programas Internacionales de la Universidad de Minnesota. que nadie pueda engañar, castigar, disparar, explotar, y mandar a volar la esperanza de un hogar por cada familia herida en el campo de batalla. Por cada veterano que perdió sus neuronas probando su agalla. Que bañarnos con impuestos de marcas reconocidas. Donde operen a tu hijo sin tenerles que pagar. Hasta que a los dieciocho años estén ready pa’ matar. Y esto mi pana es la pura realidad. Y dale stop al CD si no quieres la ver dad. Por eso en este ritmo me tengo que desahogar. Desde mi Borinquen bella, y mi Cuba donde esta? Y Una canción no basta hay tantas cosas por decir. Compre mis utopías a costo de pensamiento y hoy mis veinticuatro horas tienen su fundamento. Y lo que siempre te han dicho no es así exactamente. Te la construyen la Guasabara te la pasean por delante. Ya eres teniente por tu meritos de guerra. Te colgaran la medalla, el sello del inocente. Y gritaras emocionado, viva el señor presidente. Notaras en ese instante que han añadido otra estrella. Y justo a su lado, tu mente, tu mente. Puerto Rico y Cuba, dicen paz. Guasábara no mas.